I make salads year round, but I tend to change the ingredients of them seasonally. In the summer I like to fill my salad bowl with fresh herbs, sliced peaches and fresh garden vegetables. In the fall I tend to lean toward stronger flavors and fall fruits like crumbled blue cheeses, toasted nuts and apples or pears. I have a general formula I use when I compose my fall salad and thought it would be fun to share with you today. This is how I compose my Fall Salad, along with some ideas for ways you can do yours! Dressing: 3-4 T. olive oil based dressing of your choice. 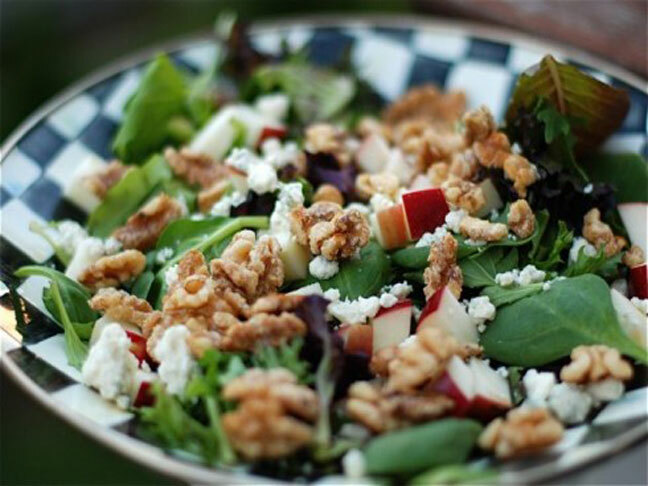 Prepare the lettuce, add the fruit, nuts and cheese and toss lightly with the dressing of your choice. You can make this salad either a main dish or a side dish, depending on the size of the salad you build.